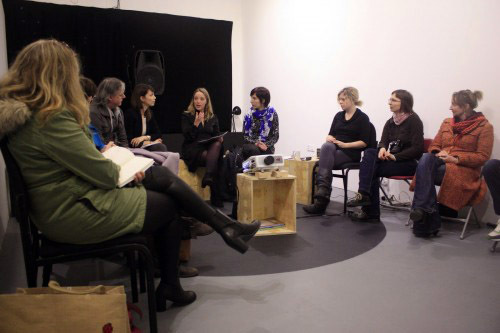 THIRD SPACE participated in a series of discussions that took place as part of Ceara Conway’s ‘Making Visible’ art project with Asylum Seekers in 126 Gallery Galway. Socially Engaged Artist Ceara Conway, invited a number of practitioners including THIRD SPACE Arts Research Collective to participate in the discursive aspect of her socially engaged art project, MAKING VISIBLE which entailed a series of discussions and knowledge sharing that aimed to highlight and Make Visible the current Direct Provision system in Ireland and to bring to light the suffering of Asylum Seekers living within this system. DAY 1 Senator Trevor Ó Clochartaigh gives Political account on the current situation of the Direct Provision system. DAY 2 Socially Engaged Artist Ceara Conway invited THIRD SPACE Arts Research Collective to participate in the discursive event “Representing Testimony in Contemporary Art” which included guests Dr Aine Phillips and Dr Rebecca Breen.